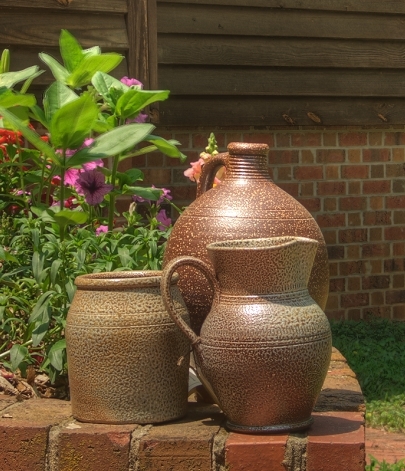 Westmoore Pottery's salt-glazed stoneware has natural variation to it; no two pieces will be absolutely identical. The pottery is made to be used as well as collected. All pieces are lead-free. The salt-glazed stoneware, though extremely durable, should not be used in either a regular or microwave oven. It is so dense that it does not cook well. (For baking, I recommend my redware.) Hand washing is recommended. The process of salt-glazing developed originally in Germany. From there, it spread to other western European countries and was introduced in North America when the continent was colonized by Europeans. When salt-glazing pottery, unglazed wares are placed in the kiln and heated to a very high temperature. At that point, salt is thrown into the hot kiln; the salt vaporizes, fuming throughout the kiln interior, and combines with the clay of the pottery, forming a natural glaze on all the pots. Salt-glazed stoneware is a more durable product than redware. It is physically stronger and can take more abuse. Patterns of reduction in the kiln give pots the same variations of color as the salt-glaze of colonial and early America - anything from a light cream or gray color to a dark brown. Where wood ash settles on the pots, the glaze may have a greenish or yellowish hue. Most of my salt-glazed pottery is undecorated. Many of the early styles of salt-glazed wares are dipped in an iron-bearing wash before firing, pushing them even more towards the brown end of the color range. Each pot will look a little different from the next, depending on how the flame passes through the stacked pottery. The salt-glazed pots are stacked in the kiln in the old style, rim to rim on top of each other. This leaves "stacking marks" on the rims of most items - smooth, but a slightly different color than the rest of the rim. Early salt-glazed pottery, made before 1850, generally had no interior glaze other than that which naturally occurred in the salting process. (In my own area of N.C., this practice was continued through the 1930's.) In the interest of historical accuracy I also add no additional glaze. This means that my wares cannot be depended upon to hold liquid for an extended period of time without some very slow seepage. Therefore, I do not recommend use of my salt-glazed pottery for long-term storage of liquids, unless you are willing to put up with a little historically accurate seepage! Much of the early salt-glazed stoneware used in colonial America was made in Europe and imported to the colonies. Some, however, was made in this country. After the American Revolution, salt-glazed stoneware became increasingly an American product.